Home / Needlework / Useful articles from newspaper tubes: we create a cosiness in the house! Useful articles from newspaper tubes: create a cosiness in the house! A pile of magazines and newspapers that littered your balcony - is not trash. Learn to see it beautiful. Create beautiful crafts from newspaper tubes - we tell you how! You are tired of old newspapers that have accumulated onBalcony and in the kitchen? Do not rush to throw waste paper away! It can serve an excellent service and become an ornament of the interior of your house. You can even give these newspapers. Does this seem too original and strange? Do not worry. You will like your present, because the newspapers will have a refined form. Most people, looking at old newspapers,Catalogs and magazines, see only garbage, waste paper, from which it would be long time to get rid of. But do not throw these sources of information. Create from them a masterpiece - a unique object of the interior. Use ancient techniques of weaving to create new beautiful crafts from ordinary newspaper tubes. Such a direction as making your own handsNice articles from newspapers, is becoming more popular for three reasons. First of all, it is a good way to spend resources sparingly and just a great method of recycling. It is not required to throw away paper products or to look for the point of reception of obsolete magazines. The second reason - the master will not needSpecific skills to start creating. This is not knitting, when you have to constantly count the loops for a beautiful pattern and the required size of the wardrobe. And this is not embroidery, thanks to which exquisite objects of the interior are created, but the occupation itself requires perseverance, painstakingness and the ability to handle a needle and thread. And the third reason that weave fromNewspapers, - the cheapness of supplies. If earlier natural materials, bamboo, rattan, palm leaves, willow rods or a vine were used for such a lesson, then today you do not have to worry about how much harm you do to nature, or to seek money for the purchase of consumables. You will manage what you have. 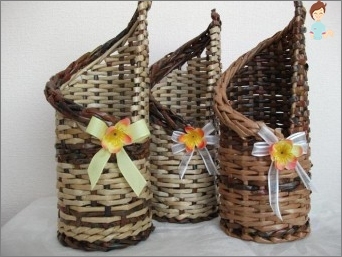 Woven baskets with their own hands will be a wonderful way to spend time with benefit. Weaving is one of the first kinds of craft,Originated on the planet. Remains of wicker baskets were found in the Egyptian pyramids. Once people have learned the simplest technique of joining together vines, grasses or twigs, the craft of creating household things from a comfortable, flexible and plastic material quickly spread all over the world. This method became popular because with itEasily manages both man and woman. To create a woven thing, you do not need to have special equipment and the master does not need to use brute force or super strength. You can join the world trend of reusing objects and develop the best traditions of the masters. What kinds of crafts from old newspapers are the mostPopular? This is a basket, a casket, a vase, a lampshade and even a portrait. 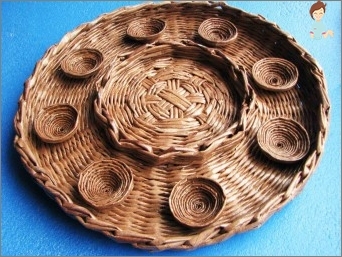 If you do not have the skills of weaving, start with a simple - basket. This kind of products from the newspaper will be a good option for crafts for beginners. You do not need special skills. And even a child can cope with this task. Such a lesson will be a great hobby for allFamily and an exciting alternative to computer games. The weaving is also useful in that it develops the fine motor skills of the hands. This is true for both children and the elderly. Form for the frame (it can be a cardboard box if the basket is rectangular). Everything is elementary simply. First, fold the newspaper sheets in half, cut them along, then start cutting the strips. You should cut the newspaper into strips with a width of 10 cm and a length of 22 cm. Place a spoke or pencil on the edge of the strip ifYou need a wide "vine", and wrap such an object with a cylindrical shape with paper. Gently fold the sheet into the tube. Attach the remaining edge to the base with glue. Remove the spoke and proceed to the next. In the same way, create 30-50 tubes. When choosing the bottom design method, you canGive preference to the usual piece of cardboard, square or round plywood. Another option - you can not use additional elements. The bottom of the basket can be weaved in the same way as the side parts. If you decide to take a support, the first tubes will need to be glued to a piece of cardboard at a distance of about 1.5-2 cm. For a basket with a woven bottom, simply place two tubes on a flat surface. Twist them third by placing one pieceTubes under the other, and then on top of it. Do the same with the fourth tube, only in the reverse order. Gradually add tubes, expanding the bottom to the desired size. For a beginner, this method can be difficult. Therefore, for the first time, use a simple and convenient system of gluing tubes on a cardboard wheel. After the frame tubes (vertical) are attached, at their base at an angle of 45 degrees, glue the tubes that will span the wireframe. Make sure that the tubes fit snuglyto each other. When you get the right diameter, the ends of the tubes are drawn perpendicular to the bottom. Hold each tube vertically, braid it the other horizontally. This is the simplest scheme, called, "Rope". For homogeneous and careful weaving, increase the tube by gluing the next one to it. You can also insert one "Vine"In another. There are many ways to weave an article. Choose the right one for you, so that this work brings pleasure. Video tutorials will help you decide. Look at the couple before you start to master the process. And at least a couple of the master classes that have been examined will not make you a master of the weaving, but they will definitely help you to master the process. To ensure that the structure does not decay under oneLook at it, use clothespins. As we weave, fasten each wall with clothespins, gradually moving them upwards. For simplicity of operation it is recommended to take a vase, bottle or box of the required shape to braid this object and thus create a symmetrical and stable design. Clothespins in this case will not be needed. When the desired height is reached, wrapThe edges of the protruding tubes inside the product and glue them to the walls of the basket. Your decor is almost ready. Go through the glue inside and out. Let it dry, then paint the basket with acrylic paint on both sides. Choose the color that most harmonizes with the situation in your home. 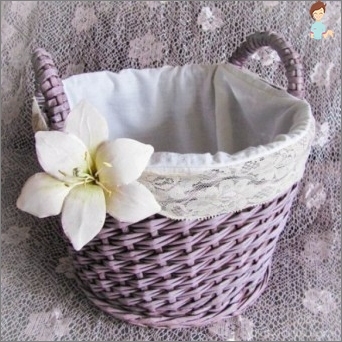 Practically in any setting, the baskets of natural tones "under the tree», And also white color. Cover the painted basket with transparentVarnish. So it will last a long time and will be less prone to kinks and moisture. You can decorate your creation with the help of various elements. You can paste, for example, flowers or patterns. You can take ready-made products that are sold in flower shops - in the form of insects, the same flowers of various shapes, animals. There is nothing difficult in realizing your idea. Experiment, this is a fascinating process. When you master the basic technique, start creating even more original items. Lampshades, breadbins, coasters, wall clocks - you can make all these interesting things for yourself with your own hands, without spending almost a penny. Wrap your creation with beautiful kraft or other gift paper, decorate with a ribbon of hemp rope. This hand-made souvenir will be a great gift for a loved one.